Midwest Moma Blog: Daisy Girl Scouts 3 Cheers Journey Activities! 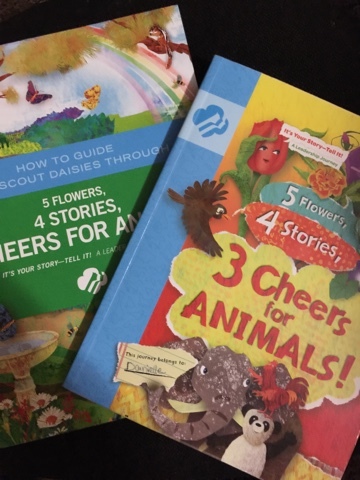 In our adventure into Girl Scouts independently without a troop, my daughter and I have found many fun ways to make up for the lack of a troop. I love that the GS store allows me to purchase the troop leader information so that I can help Danielle successfully move through earning her badges. Our current adventure is the 3 Cheers Journey for the Daisy level scouts. The leader book has session lined out to help lead troops through the program. A lot of these activities are developed for a group of girls. When you are working with just one girl and at a faster pace, you've gotta do things a little different. Below is a list of activities that are suggested in the adult book for the journey that my daughter and I changed to meet the needs of our situation. The team bird bath is used hold drawings and sentences that capture their ideas on how to care for animals. 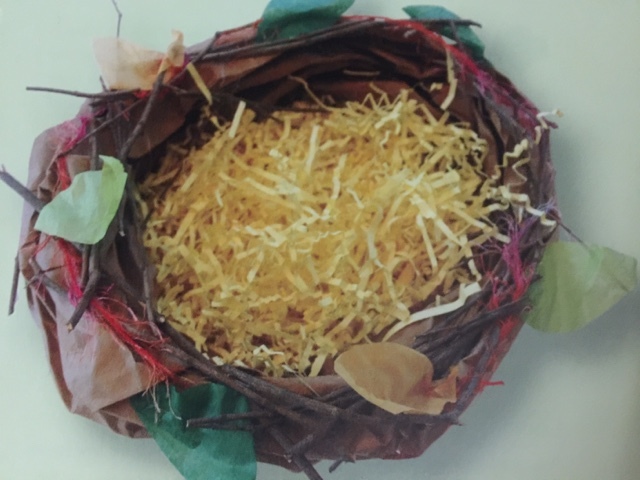 During the second session, the girls are prompted to create an All About Me Nest. The All About Me Nest is used to hold all the things the girls learn. Each girl will have her own All About Me Nest and the troop shares the Bird Bath. Since the "troop" and the girl is the same for us, we changed up their uses just a little bit. The All About Me Nest is used at each lesson and my daughter will write or draw something that we talked about that she already knew (for example, we did a field trip to our local zoo and we talked about habitats, she wrote about the penguin habitat in her nest. She already knew where they lived thanks to movies like Happy Feet ;) ). The Bird Bath we use to put information that she learns as we go. If she discovers a new fact about the animals we are talking about or learning about, she writes it down and puts it in her bird bath. The Red Robin Project is designed for the girls of a troop to show off what they have learned. The idea is to complete a project that shows off their new found knowledge to their parents. Since both her father and I are involved with her program, we were already aware of what she was learning. From the beginning of her joining Scouts, I made her a journal so she could write down what she learns throughout the scouting program. For the Red Robin Project, we had her write a short story about how to take care of animals and read it aloud for us. This allowed her to meet the requirements of earning the Red Robin portion of the journey. This is the final step to the 3 Cheers journey. 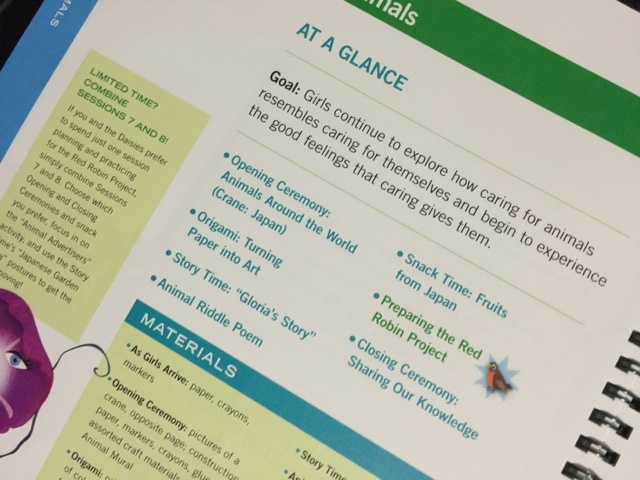 This project is designed to have the girls perform a game where they act out an animal they learned about and the audience has to guess what animal. They go on to discuss how they care for animals. For this project, we had Danielle tell us about the animals on her mural (see the adult handbook). 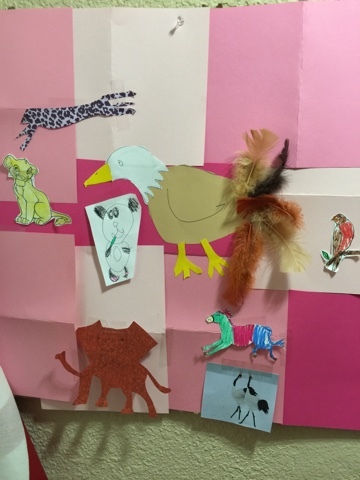 Each week, the girls are prompted to create a specific animal for the mural and then they do a craft or read a story about the animal. For the Tula Award, we had the girl point out the animals on the mural and tell us one thing she learned about the animal. 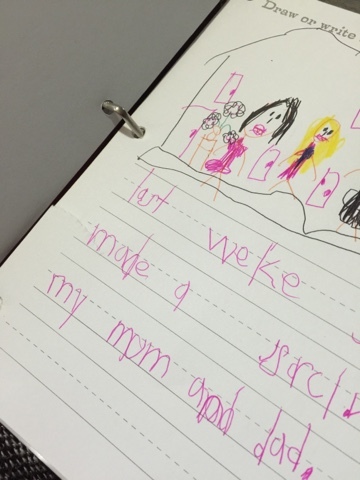 We finished with her writing in her journal again about her favorite way to care for animals. This journey was a lot of fun to work through. The girl's book companion has a list of recipes for snack ideas for the meetings during the sessions. There are some pretty fun snack ideas and a couple of them have been added to our weekly after school snacks!